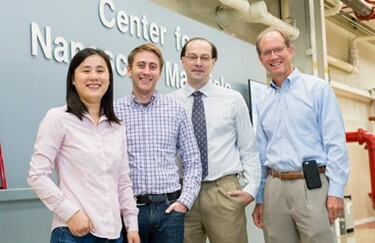 A team of researchers at the U.S. Department of Energy’s (DOE) Argonne National Laboratory, the University of Chicago and Northwestern University have successfully surmounted the significant challenges of measuring how nanoplatelets, which consist of two-dimensional layers of cadmium selenide, interact with light in three dimensions. Advances in this area could enhance the operation of quantum optic networks. Single-photon sources like these are needed for applications in long-distance quantum communications and information processing. These sources, which would serve as signal carriers in quantum optical networks, emit light as single photons (light particles). Single photons are ideal for many quantum information science applications because they travel at light speed and lose little momentum over long distances. The nanoplatelets form subatomic particle-like entities called excitons when they absorb light. The vertical dimension of the nanoplatelets is where the excitons undergo quantum confinement, a phenomenon that determines their energy levels and parcels electrons into discrete energy levels. Some of the nanoplatelets for this research, which have remarkably uniform thickness, were synthesized in chemistry professor Dmitri Talapin’s University of Chicago laboratory. Talapin is another co-author of the paper and has a joint appointment with Argonne. “They have precise atomic-level control of nanoplatelet thickness,” Ma said of Talapin’s research group. The nanoplatelets are approximately 1.2 nanometers thick (spanning four layers of atoms) and between 10 and 40 nanometers wide. A piece of paper would be thicker than a stack of more than 40,000 nanoplatelets. This makes it harder to measure the material’s interactions with light in three dimensions. Ma and her colleagues were able to trick the two-dimensional nanoplatelet material into revealing how they interact with light in three dimensions via the special sample preparation and analysis capabilities available at the CNM. The transition dipole moment is an important three-dimensional parameter operating on semiconductors and organic molecules. ​“It defines, basically, how the molecule or the semiconductor interacts with external light,” Ma said. But the vertical component of the transition dipole is difficult to measure in a material as flat as the semiconducting nanoplatelets. The researchers solved that difficulty by using the dry-etching tools of the CNM’s nanofabrication cleanroom to slightly roughen the flat glass slides upon which the nanoplatelets are placed for close examination via laser scanning and microscopy. “The roughness is not so large that they distort a laser beam, but enough to introduce random distributions of the nanoplatelets,” Ma explained. The random orientations of the nanoplatelets allowed the researchers to assess the three-dimensional dipole properties of the material by special optical methods to create a doughnut-shaped laser beam within a unique optical microscope at the CNM. The team’s next step is to integrate the nanoplatelet materials with photonic devices for transmitting and processing quantum information. ​“We’re proceeding in this direction already,” Ma said. This research was supported by the U.S. Department of Energy’s Office of Science and the National Science Foundation. The Center for Nanoscale Materials is one of the five DOE Nanoscale Science Research Centers, premier national user facilities for interdisciplinary research at the nanoscale supported by the DOE Office of Science. Together the NSRCs comprise a suite of complementary facilities that provide researchers with state-of-the-art capabilities to fabricate, process, characterize and model nanoscale materials, and constitute the largest infrastructure investment of the National Nanotechnology Initiative. The NSRCs are located at DOE’s Argonne, Brookhaven, Lawrence Berkeley, Oak Ridge, Sandia and Los Alamos National Laboratories. For more information, visit https://​sci​ence​.ener​gy​.gov/​b​e​s​/​s​u​f​/​u​s​e​r​-​f​a​c​i​l​i​t​i​e​s​/​n​a​n​o​s​c​a​l​e​-​s​c​i​e​n​c​e​-​r​e​s​e​a​r​c​h​-​c​e​n​ters/. The U.S. Department of Energy’s Office of Science is the single largest supporter of basic research in the physical sciences in the United States and is working to address some of the most pressing challenges of our time. For more information, visit https://science.energy.gov/.